Just when you think you’ve seen it all, the world is introduced to the very first human-carrying drone. Called the Ehang 184, the Chinese made drone is unique thanks to its single passenger seat. The name itself comes from the fact that it can carry one passenger, has eight propellers, and four arms. The drone measures 18 feet long, and is able to land and be compacted into the size of a parking space. However, the drone can only carry up to 220 pounds of weight, meaning that many people tipping the scales at 200+ pounds won’t be able to lift off in it. 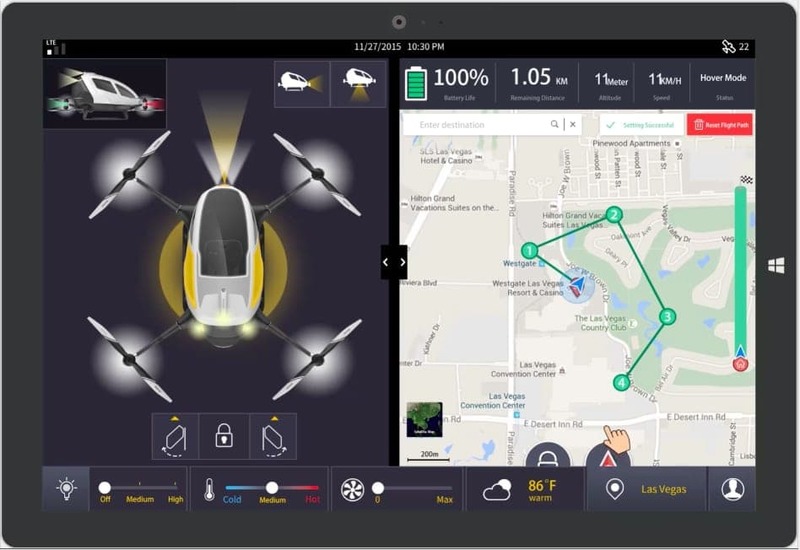 The drone taxi is able to fly for a total of 23 minutes with its green electric battery pack, reaching speeds of up to 60 mph, and able to fly above the clouds to a maximum height of about 11,500 feet – higher than skydivers jump! Whats even cooler is that fact that you’ll be able to use this drone taxi much sooner than you think. The first models are going to be rolled out in Dubai, with fleets of drone taxis soon to take to the skies in the summer of 2017. 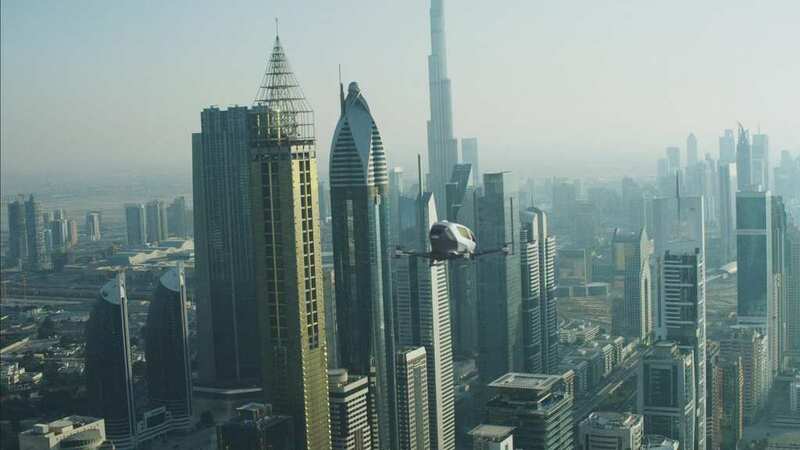 In fact, the the Emir of Dubai Mohammed bin Rashid has said that this is the first step in his vision of seeing one quarter of all transportation in the city of Dubai being conducted in driverless vehicles. They already use robot camel jockeys, so driverless cars on desert roads of the Emirate are probably also not too far off! 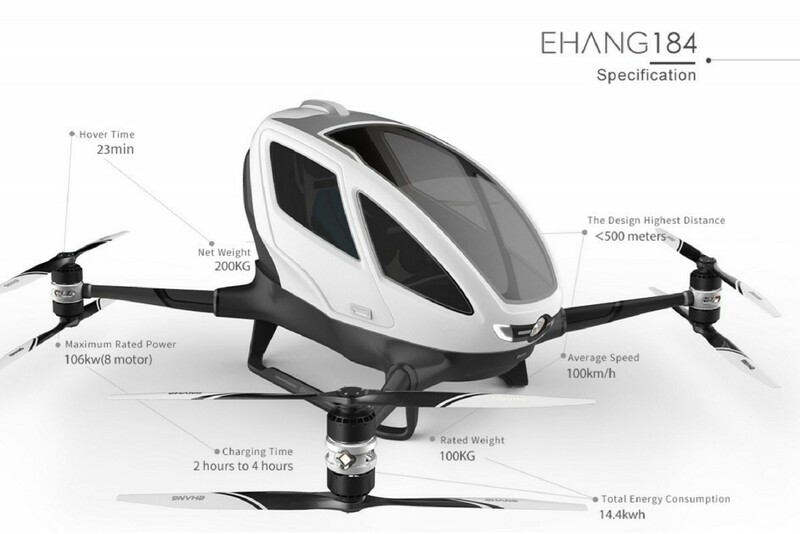 Having such a short battery life means that the Ehang will only be able to fly short distances. However, in a country which regularly has temperatures of over 105 degrees Fahrenheit – along with regular sand storms – people are more likely to want to take this VIP form of transportation than walk the five or six blocks they need to get to where they need to be. Some people have wondered about the safety of flying in a passenger drone with no real control over the device. But having a drone automatically fly you from one place to another eliminates the single most dangerous aspect of flying – human error. Additionally, should the drone lose power to one of its rotors, there are backup power sources ready and able to get you back on-line and to your destination. These drone taxis will have a luxurious heads up display, equipped with a touchscreen to control and pinpoint where you want to go , along with controlling the air conditioning, making sure the doors are locked, controlling the interior and exterior lights, and even determine when and where you want the drone taxi to hover if you see something cool! Therefore, you still have some input as to what the taxi does, and can do whatever you want to customize your ride in order to make your ride more enjoyable. With battery life improving all of the time, and the demand for green energy passenger drones only going to increase, this revolutionary new form of transportation is really going to take off, with little drones zipping around the skies of your city in the works soon!